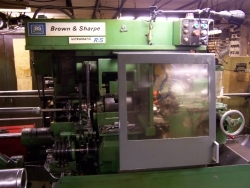 B&S Ultramatic 4 Speed Screw Machine With CNC Retrofit. Okuma Captain L370 MW Lathe with Sub Spindle & Mill / Drill Capability. 2.750 through spindle bar capacity with 8 inch chuck capacity. Equipped with S3 LNS Servo Bar Feeder. 2.750 through spindle bar capacity and 8 inch chuck capacity. Equipped with S2 LNS Servo Bar Feeder. Brothers S2A Drill / Mill / Tap Machining Center. B&S #2 Ultramatic 4 speed 4 slide 6 hole turret with CNC Retrofit Screw Machine 1. 625" bar capacity. with 1.250 to 1.625" bar capacity. Two B&S #2 Automatic Screw Machines 1.500" bar capacity. Five B&S #00 Automatic Screw Machines .500" bar capacity with various attachments. 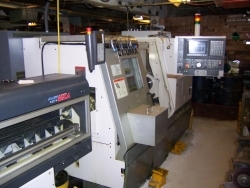 We also have a full assortment of support manufacturing equipment.